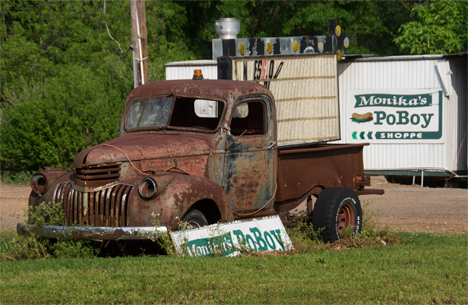 Despite its disheveled appearance, this 1946 Chevy truck is an attention getter for Monikas Po-Boys on US Highway 165 near Olla, Louisiana. 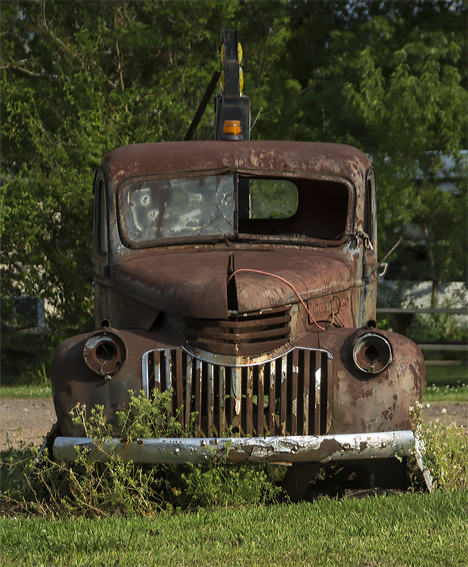 Tooling north of Olla, Louisiana, on U.S. Highway 165, I did a double take when I caught a glimpse of the bedraggled ’46 Chevy truck, Saturday afternoon, April 26, 2014. Despite the fact that it has obviously been “rode hard and put up wet” a few times too many, it still brings back a smile or two. My good friend, the late Bob Swilley, drove a 46 Chevy truck in high school and gave me plenty of rides when I would have had to walk otherwise. The truck did not have a “syncro-mesh” transmission so it had to be double-clutched when Bob shifted gears. Bob taught me the art of double-clutching in the old Chevy. He was patient, but winced a few times when we heard gears grinding against gears during my instructional classes. If we happened to land at his house around suppertime, I was expected to stay and join the evening repast. The reciprocal was true at the Dempsey household. I started this trip on Friday leaving from Pine Bluff, headed to Woodworth, Louisiana to take care of some family business with my mother, brother, and sister-in-law. The trip is just a tad over five hours, by the most favored route. I took the less traveled seeking photographic and prosaic fodder for Weekly Grist and the Corndancer Photo of the Week. I struck the mother lode at McNeely, Louisiana where I found a sight for previously deprived eyes. Go to the Photo of the Week Page at Corndancer dot-com to see that about which I talk. 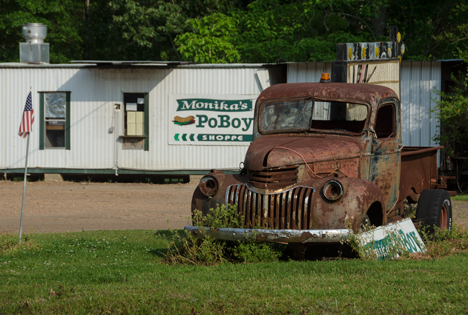 Unfortunately, it was late Saturday afternoon when I passed Monika’s Po-Boys and she was not open for business. Had she been, I would have visited her sandwich emporium and bought some nourishment. Although I did not get to bite into a Monika Po-Boy, if the sandwich was a good as her promo is cool, it woulda been fine. A slightly different angle showing the establishment. Whaddaya wanna bet that Monkia and family reside behind the establishment? 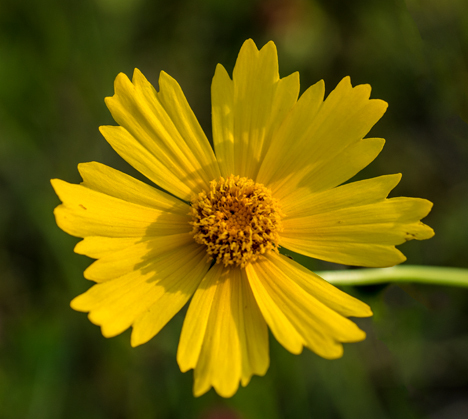 I was parked on the highway shoulder shooting the truck pix when I noticed some fine yellow flowers. Too good to pass up. Thanks for joining me on this trip. I have high hopes that you finish this article with a smile on your face. If so, I have been successful. 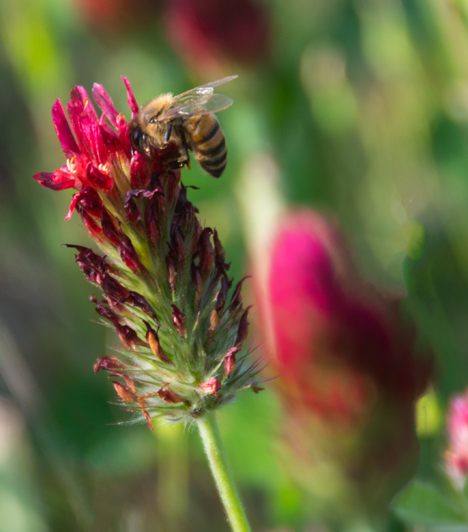 Massive clumps of red clover on Arkansas roadsides are temping photo targets. In some cases, life and limb are at risk in capturing these images. Fortunately, these pictures came from safer environs. My first clover shooting attempts this year came close to “run me over in the clover.” I stopped on the shoulder of I-530 right here in LA (lower Arkansas) to get a couple of quick shots. By the time I rounded the back of the truck to get into shooting position I was questioning my decision making process. Wherever those muthas were going, they were in a big hurry. I got my shots and made it back to the cab with all attachments in place and functioning by the hair of my chinny-chin-chin. This clover is on US Highway 79 west of Fordyce, Arkansas, a substantially safer shooting environment than the suicidal interstate where I shot my first clover of the year. 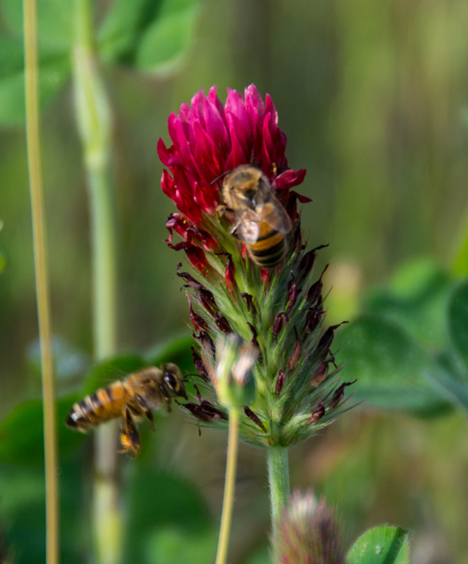 I put the clover shot on Facebook and discovered that I am not alone in greatly admiring our prolific Arkansas roadside clover. With that discovery in hand, I set out to find roadside clover in a less suicidal environment. U.S. Highway 79 west of Fordyce, Arkansas was the ticket. It is a four lane thoroughfare with grassy medians populated with many clover clumps. It also has handy lane crossovers that clover seems to favor. So if on Saturday afternoon, April 19, 2014 you happened to be traveling US 79 in that vicinity and saw some fool crawling around in the median ditch, it was yours truly. 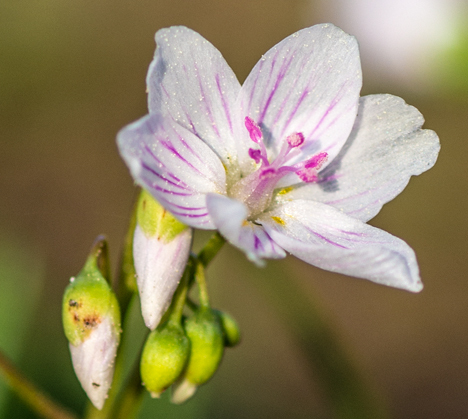 The rewards of ditch crawling were some decent images of clover, some of which you are seeing here. 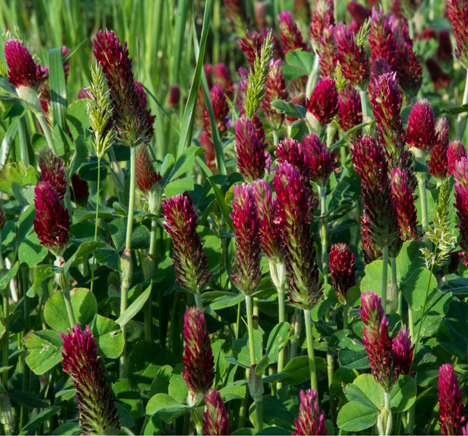 You can see more of the clover pictures on the Photo of the Week page at Corndancer dot-com. 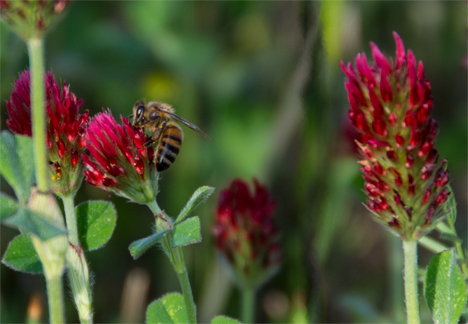 We are showing the wider shots there and the narrower ones, with bees here. Take a gander and we will wait here. 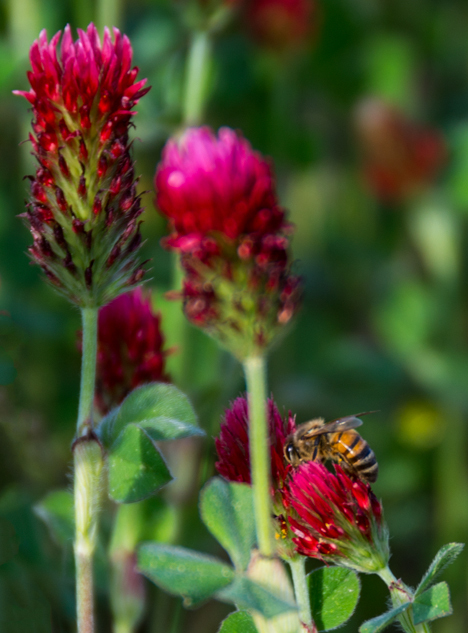 The bees were working the clover well which always makes for interesting closeups if you are willing to grovel in clover. Just in case you are not willing, I did it for you. The following images are yours without grass stains, back aches and shoulder stretches. Please enjoy them to the best of your ability. Thanks for looking. 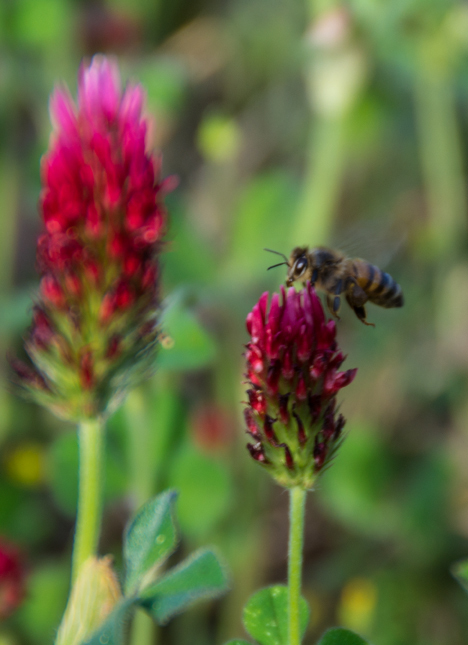 In this case, we let the bees and the flowers speak for themselves. There’s not much we can add to Mother Nature’s perfection. In this case, she received help from the Arkansas Department of Highways and Transportation. We are grateful to both. 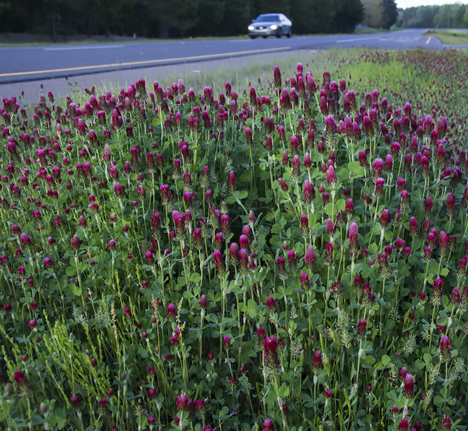 We would be remiss if we did not show the crimson blooms in their environment, a highway median. 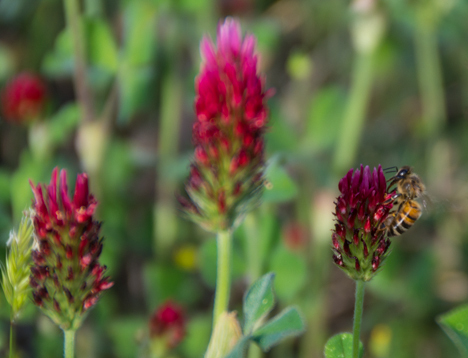 Complete with unsuspecting motorists who looked up and saw a camera protruding from a clump of clover. Wonder what they thought? 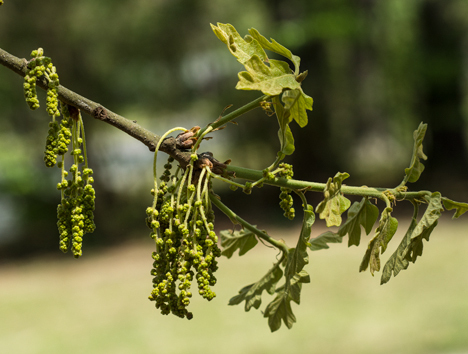 The number one springtime trouble maker in our neighborhood jungle, oak catkins. 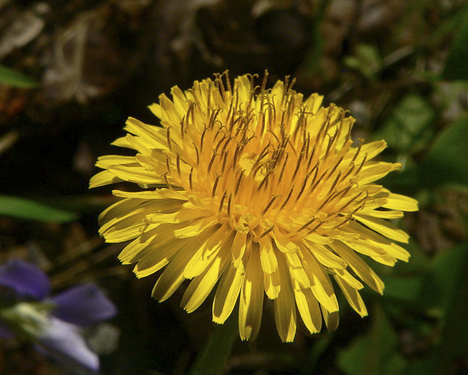 There must be a jillion of these pesky critters that crank out pollen for a couple of weeks or so each spring. Throw in about half that many Pine catkins and you have the annual powdery yellow peril here in LA, part of the price you pay for wonderful shade trees. 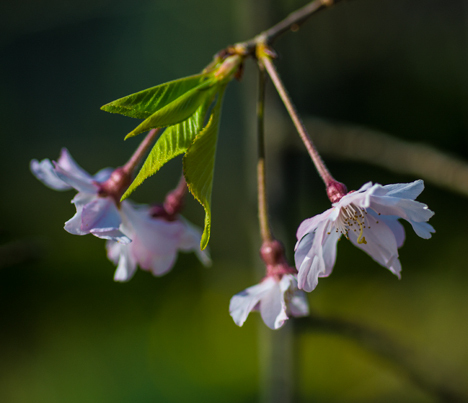 The second half comes due in the fall when our yards become ankle deep or better in leaves. That also ushers in the annual controversy about raking leaves. I like to see ’em where they are. I like to feel the crunch under my feet. I always loose the battle and then suffer the ignominy of footing the bill — to have leaves raked and bagged — that I want to stay in place. While I have deep admiration for the visual pleasantness of yard plants and shrubs I have a deep and abiding abhorrence to yard work. After all, mowers and other tools of mass plant destruction callously dismember the tiny plants I like. At this point I politely suggest that you check out the Photo of the Week page at Corndancer dot-com where this story started — and where you can see nine more pictures from this story-shoot. We will wait for your return right here. 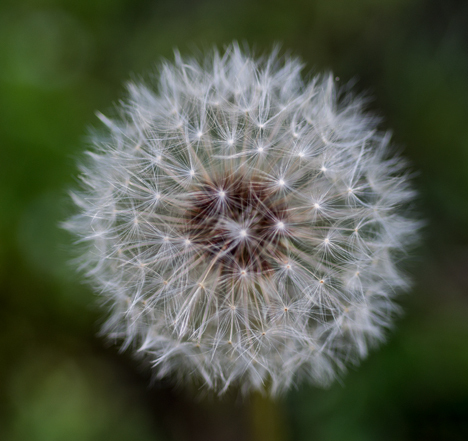 When the dandelion goes to seed, the grand design would choke all but the most sophisticated graphics processors — and tax the patience of most designers. One could stare at it for a while and continue to see visual nooks and crannies. 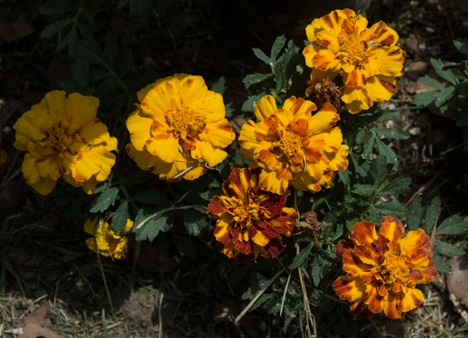 Marigolds actually planted by a Dempsey, but not this one. Mrs. Dempsey set these out. They are also handy around tomato plants as they discourage bugs from the general area. 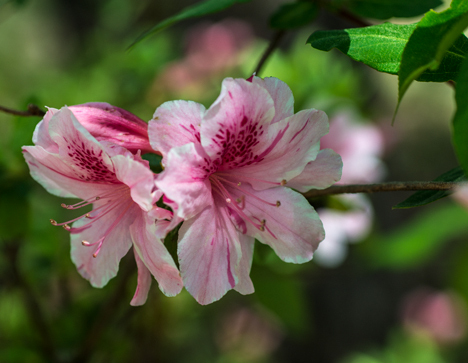 More blooms from the grounds of the Chez Dempsey. This plant and several more like it were in place decades before the place became home to the Dempseys. I claim no credit. Miss Erma Chastain, my second and third grade teacher was kind enough to reveal the name of this poesy to the classes. The info stuck. This one is in the yard of the Chez Rubenstein across the street. The cruel mower had ground my collection of Spring Beauties to smithereens. These blooms are pushing it to be a quarter inch across the beam. 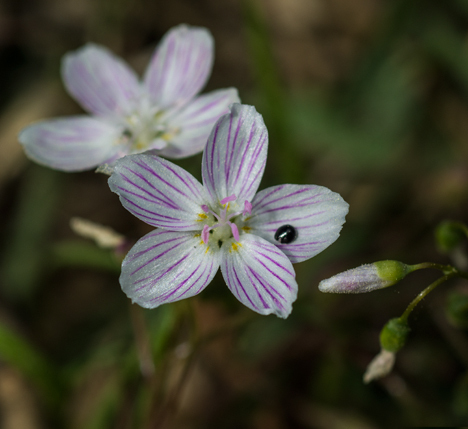 The bug on the Spring Beauty petal is about the size across of a common pencil lead. 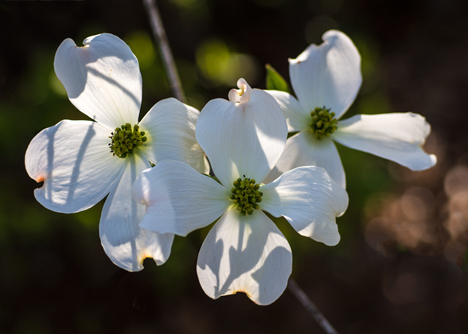 These dogwood blooms are courtesy of Ms. Kitty of the Chez Rubenstein, our resident neighborhood master gardener. She’s doing something right because other dogwoods nearby became kindling wood a winter or so back. Back lighting adds a tad of drama to some already cool blooms. 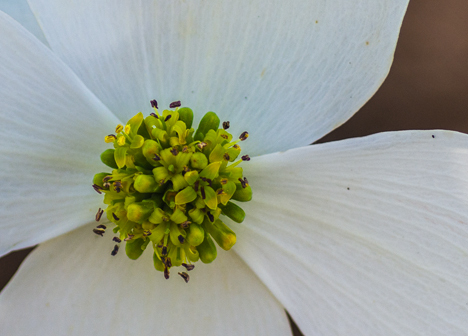 The dogwood’s “business,” a complex collection of reproductive accoutrements. More power to ’em. I am not certain what this is, but it does enjoy my full approval. Another Ms. Kitty tree. And now friends, as the sun sinks slowly in the west, Ms. Kitty’s jonquils become back lit, adding a bunch to their overall coolness. 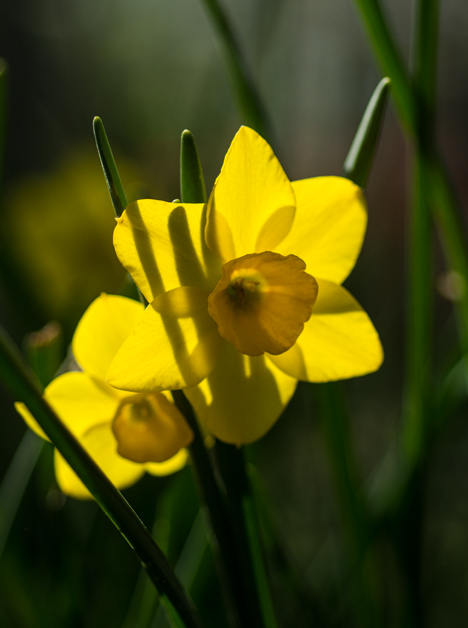 I had shot the same jonquils earlier and deduced that this set of conditions would occur later. So later I returned and happily discovered that my prognostications were correct. May I encourage you to explore your surroundings and see if similar discoveries in your environment await well, discovering. It is cheap, non-fattening, low-impact and possibly elucidating entertainment. Good luck. If you were in the Army in the mid fifties to early sixties, you will recognize the inside of this M38A1 Jeep which was referred to as an “A1” to differentiate it from it’s predecessors. Click on the jeep to see our original September 2010 post that included this vehicle. Back in September 2010, I attended an event which definitively proves that “boys will [continue] to be boys,” regardless of age. The difference is the size and cost of the toys.This we are sending you back to that story. It’s kind of an “udn, udn” thing. Click on the jeep to see more vintage military vehicle pictures at Corndancer dot com. excellent results — representing no small investment — and I was there. I attended a rally of the Arkansas Military Vehicle Preservation Association at Petit Jean State Park. Attendees from several states brought their persons and vehicles which made for a respectable collection of vintage hardware. Activities included a jeep mounted blank-firing machine gun and a “convoy” around the park premises. Heady stuff for military history nuts. I must confess, I am infected and enjoyed every minute of it. The story actually started on the Photo of the Week page at Corndancer dot-com where you will see the jeep mounted machine gun, a well restored WWII military Harley Davidson “Hog” and a lot more.